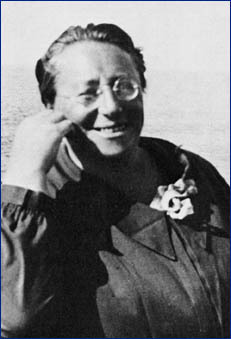 Emmy Noether is one of the most famous female mathematician. She is born in 1882 in Germany and died in 1935 in Pennsylvania. She had a really hard time to study mathematics and to be allowed in some institutions because of her gender. Therefore after many years of hard work, especially with her father which is also a mathematician, her works has finally been recognized. Albert Einstein even called her the most “significant” and “creative” female mathematician of all time. She made important contributions to modern algebra, analysis and mathematical physics. Two of the most popular works of Emmy Noether are the invariant theory and the Noetherian Ring. Both are related to modern algebra. For more detail about those theories I suggest you to watch the video following. Hopefully, in 1970, someone make honor at Emmy Noether and made a book with all her works joined.